Associated Builders and Contractors on Nov. 28 released its 2018 Merit Shop Scorecard, an annual state ranking based on policies and programs that encourage open competition, education and job growth, and award construction contracts based solely on merit, regardless of labor affiliation. Florida topped the list this year, vaulting from ninth position in 2017 to first based on the state's free-enterprise and open-competition approach to the construction sector, increased career and technical education opportunities and job growth rates. Michigan saw the biggest improvement in its ranking, rocketing from 24th in 2017 to seventh this year after the repeal of its prevailing wage law, which will result in greater competition and lower costs for construction projects. "States like Florida and Michigan have built an environment that allows merit shop construction contractors to thrive," said Ben Brubeck, ABC's vice president of regulatory, labor and state affairs. "Prioritizing policies that support small business owners, the American worker and the overall construction sector spurs economic growth, which directly leads to more projects and therefore more construction jobs across the country." Comparatively, California tumbled from 38th to 50th this year due to a decreased focus on workforce development and careers in technical education, which remains a priority for ABC members and the overall construction sector. California was trailed only by Illinois, which was ranked last for the second year in a row with an F rating in project labor agreements, prevailing wage, Right to Work and workforce development incentives. "Much of the movement up and down in the rankings was due in part to the level of state policymaker support for workforce development and technical education," said Brubeck. 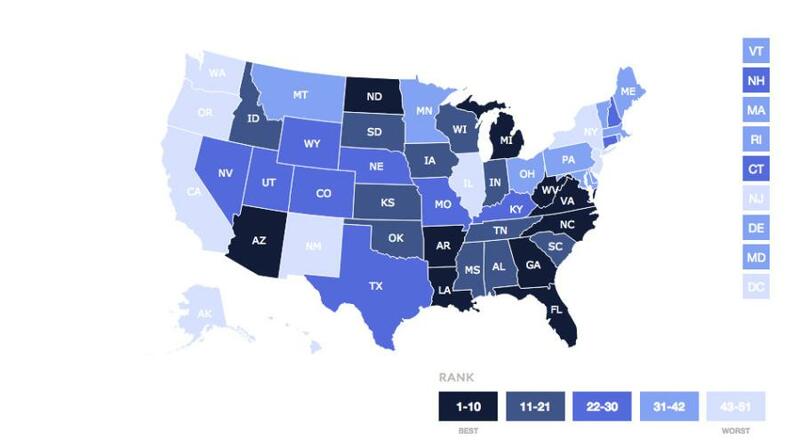 "With an estimated 500,000 open construction positions in the United States, it is essential that states prioritize workforce policies that recruit, educate and benefit the American worker and fill the skills gap."